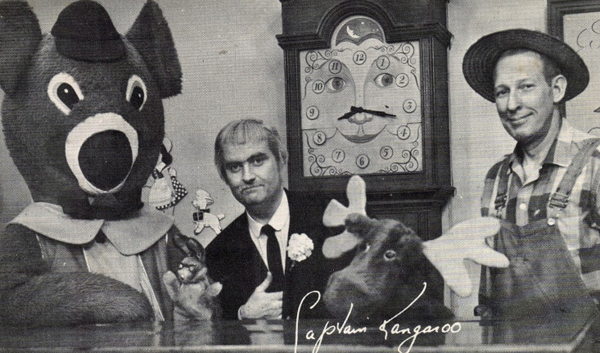 Captain Kangaroo aired on CBS on weekday mornings from 1955 to 1982. It starred Bob Keeshan as the Captain - the "kangaroo" came from the fact that he had big pockets in his jacket - but I don't know if they were magically deep or if they provided him access to all sorts of gizmos through some kind of inter-dimensional wormhole. I don't think they did. 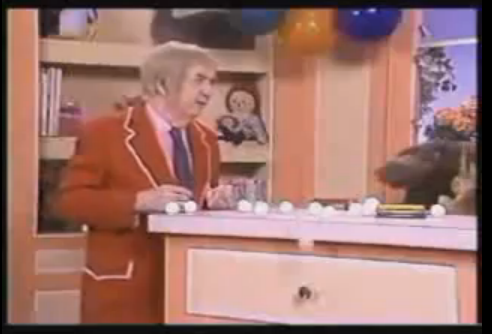 The highlight of the show was when his main sidekick - Mister Moose - would give the signal to unleash a ton of ping pong balls on Keeshan's head. I found the below comment on Youtube. This is the Captain's whole gang from the early days, when the Captain used to wear make-up to seem older -- from left: Dancing Bear, Bunny Rabbit, good ol' CK, Grandfather Clock, Mister Moose, and Mister Green Jeans.